Excellent to deal with, plum, pear, peach and sometimes mahaleb cherry rootstocks, as well as peach and pear seed. Heritage Fruit Trees Rootstock. Contact Rob Pelletier. Apple, cherry, quince, pear, plum and St Julien A plum rootstocks. Propagating deciduous rootstocks for groups conducting grafting days or other uses. Rootstocks for nearly all fruit types can be grown from seed but this isn’t always desirable as seedlings can be very variable. A lot of the rootstocks we use for fruit trees are grown clonally and here are some suggestions with ideas for the home gardener rather than commercial propagation. Apples, quinces and likely other things can be easily grown in a stool bed situation, rootstocks are planted in a row on an angle of around 45 degrees and once they are growing well they van be pinned to the ground. They should have been spaced so that once pinned they link up. Shoots will then grow up vertically and these can be covered with soil, saw dust or potting mix, roots form under the medium they are covered with. Each year when they are dormant the soil/sawdust is removed and the shoots that have grown in the last season are removed with their roots. Commercial production may rely on herbicide to control weeds. Quince rootstocks can also be propagated by hardwood cuttings taken in winter as can plum rootstocks, the cuttings are best treated with Clonex (TM) or other rooting hormone and kept in an airtight bag in a fridge for a couple of weeks prior to planting. Cherry rootstocks are best grown from root cuttings. What about smaller quantities that groups conducting grafting days would want? Many won’t want to use herbicide so what should we do to grow them without herbicide. Let’s start with an approach similar to what I recommend for no-dig gardens- The only difference is I’m going to dig it! The intention is to actually raise the rootstocks in a productive vegie garden situation (or whack in a few flowers if you like). So, work out how big your garden/rootstock propagation area is to be and do a weed threat assessment . All running weeds like kikuyu and couch need to be removed from the site, use either a mattock or rotary hoe set quite shallow so it just removes the grass and weeds, clean up the area intended for the garden/rootstock propagation and a path/weed barrier around the edge. With dock it is best to dig the roots out as deep as you can and it is an indicator of poor drainage. You may wish to make concrete borders to protect the area from weeds, black plastic is an easier option but perhaps not as good as a concrete border but still can be effective. So, it’s bare earth, mark out your beds at perhaps 800mm wide and assess the soil, if the fertility isn’t good you may wish to dig in some compost or even perhaps some sheep manure in moderation, dig to shovel depth in the beds and leave the paths undug. Raising rootstocks in the no/minimal dig situation. 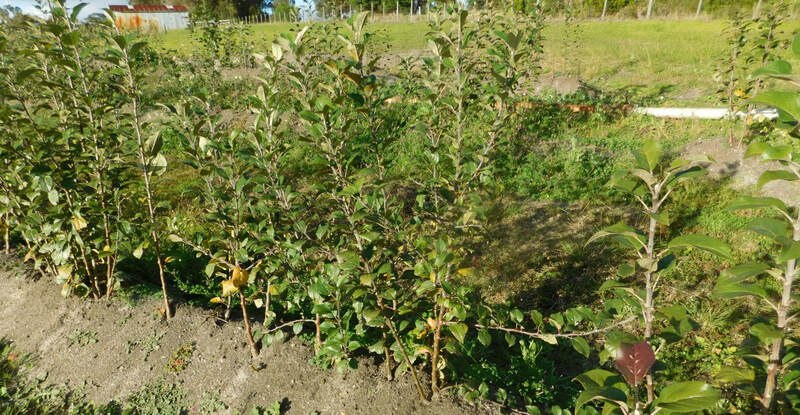 For apple and quince rootstocks plant a rootstock in the ground normal depth, in the 800mm wide beds do two rows with the rootstocks perhaps 600-700mm apart and cut them off 100mm above the ground. Keep the soil moist to germinate the maximum amount of weed seeds and when the weeds are still small cover with about 20mm seed free mulch, avoid disturbing the soil as soil disturbance causes more weeds to germinate. The mulch will suffocate the weeds while they are small but if you put it on before the weeds germinate they will grow up through the mulch. As the rootstocks start to grow, get some large plastic flower pots and cut the bottom out then put a straight cut top to bottom so it can be opened up to remove it to harvest the rootstocks next winter. As they grow keep adding sawdust/potting mix to the pots around the shoots and keep it moist. First season grow peas or beans between the pots/rootstocks and inoculate the seed with nitrogen fixing bacteria, once in the soil the bacteria can survive up to three years without a host. There's a video here. Expect 6-8 rootstocks per plant in the third year so that is around 20 per metre of 800mm wide bed. Once you have grown the inoculated peas or beans in the bed around the stool bed pots you can treat it as a vegie garden but avoid all Solanaceae (tomatoes, capsicums, eggplants and other members of the family) and possibly strawberries. Also avoid vegies that need digging to harvest. If growing plums or quince from cuttings or cherries or pears from root cuttings then three rows in the 800mm wide beds with cuttings 300mm apart which should give around 10 per metre. Scarify the beds to remove all germinated weeds at time of planting cuttings. Plant pencil length, roughly pencil thickness cuttings with 60mm out of the ground intending to cover the whole bed with a seed free mulch to a depth of 20mm a fortnight or so after planting the cuttings. Outside rows 150mm in from edge of bed. Radishes could be planted between the rows after mulching or cucumbers or rockmelons after the plum and quince cuttings have shoots 20mm long. Pears and cherries grown from root cuttings may need longer before interplanting with vegies. Pears can also be grown from seed in a garden situation. Your group may want to graft and grow out left over rootstocks from the grafting day, grow them in beds 800-1,000mm wide in three rows 300-400mm apart, pears, quinces, less vigorous apples 300mm apart, cherries, plums and more vigorous apples up to 400mm apart. Plant peas, New Zealand yams or other low growing vegies underneath, once again none of the tomato family or strawberries. Groups should establish a plum rootstock tree and perhaps a quince rootstock tree with one of their members so people can get cuttings to grow each year. Rootstock propagation doesn’t have to all be on the one site, different people might like to grow a few apples, quinces, plums or whatever and share them around the group. Also if would be good if each group had a pear suitable for interstems between quince and pear, varieties such as Burre Hardy and Vicar of Winkfield are good ones. 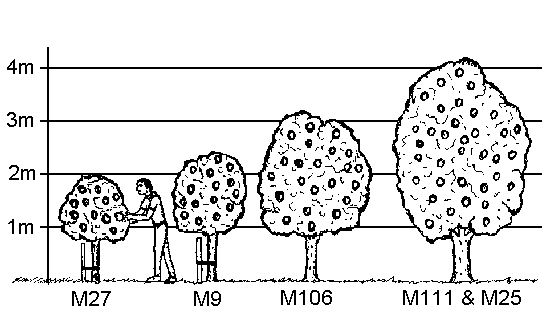 M27, M9 are very good as dwarfing interstems that allow people to grow a small apple tree on a hardy woolly aphis resistant rootstock, each group could have one tree of M7 or M9 grafted on a hardy vigorous rootstock so each year they could get interstem material.